Browse the links below for the latest press releases and news articles featuring Voilà Chocolat offering chocolate experiences in New York City. We are often in the news for our mobile chocolate-making station, our chocolatiering classes for kids and adults, our personalized gifts, our walk-in classes and for our commitment to being a valuable member of our community. If you would like to write about us, we'd love to hear from you. Please contact us at INFO@VOILA-CHOCOLAT.COM. CBS New York, Best of NY - Voila: Do You Like To Do It Yourself? Valentine’s Day remains a month away. But it’s never too soon to start planning, which explains what I was doing last week at Voilà Chocolat, a new chocolatier on West 79th Street. Unfortunately, the treats from that adventure are now all gone—consumed primarily by myself—so a return visit may be required. Before I go on about Voilà, though, I have to say that I have trouble comprehending why—in this gender-neutral age—the pressure is still on the guy to come up with candy and flowers. Until my wife and daughters shower me with bonbons and roses, I refuse to believe we live in a post-sexist society. Now, with that said, Voilà appears a reasonably new twist in the chocolate category, which isn’t typically associated with disruptive, Internet startup-style innovation. At Voilà, you make your own chocolate; though, buying it is also an option. The idea came to Voilà’s founder, Peter Moustakerski, when he took his daughter to a store where she could design and make her own pottery, soap and candles. The occasion was her birthday. I could probably come up with a few reasons, even though I defer to no man, woman or child when it comes to my passion for chocolate. My brothers and I were terrible eaters. Were it not for chocolate, we probably wouldn’t be alive today. Chocolate wasn’t a snack food at our house. It was the centerpiece of our diets. Nonetheless, I’d probably put chocolate in the controlled substance category—not the arts-and-crafts one. It’s more like heroin, or at least a good single malt, than soap and candles. And in the same way I wouldn’t harvest poppies or malt barley, I wouldn’t make my own chocolate. Chocolate, in short, is the quintessential guilty-pleasure impulse item. Mr. Moustakerski is also from Bulgaria, having left a year before the fall of the Berlin Wall. Bulgaria doesn’t leap to mind as a traditional hotbed of chocolate connoisseurship; I’ve never heard anyone describe it as the Switzerland of the Balkans. I got no argument from the new business owner. However, Mr. Moustakerski said because merchandise was limited—and not just of chocolate—the likes of his mother and grandmother learned to make from scratch. “That connection with food and the time and effort people invested in food is deep in my DNA,” he said. Also, Voilà’s chief chocolatier is Christophe Toury, former chocolatier executive pastry chef for Jacques Torres. So it isn’t as if Mr. Moustakerski is slaving away in the kitchen all day sweating cocoa beans, or however chocolate gets made. Indeed, you’re not so much making your own chocolate at Voilà as molding, squeezing, pouring and dipping melted chocolate made by somebody else. In short, any dolt—I’m thinking of myself—should be able to produce a presentable box of chocolates. Here’s how the concept works: Take a seat at a “chocolating pod,” where the melted or “tempered” chocolate—milk, dark or white—is poured into heated bowls. There’s also a host chocolatier to guide you through the process. The options include making and decorating chocolate lollipops; truffles—“We premake the ganache, they get a ready-made center they can dip,” Mr. Moustakerski explained; chocolate-dipped treats such as candied pineapple, orange, kiwi, pretzels and biscotti; and chocolate bars, of course. A session runs from 30 to 60 minutes and costs from $35 to $60, depending on what you’re making. And before you leave, the chocolate is cooled in a refrigerator so your treats don’t melt on the way home. Mr. Moustakerski sees his 79th Street location—next door to the venerable Dublin House where you can drop by and perhaps charm the bartender into trading a shot for a truffle—as but the concept’s overture. Voilà’s target demographic, as Mr. Moustakerski told me, is…parents with children, office parties, book clubs, people on dates. In short, life on Earth. As I may have mentioned, I was skeptical. But if chocolate is your vice, making your own feels like minting money. You suddenly need not fear where your next fix is coming from. And since you’d no sooner discard the remnants of a bowl of rich chocolate than you would a wad of $20 bills, you’re invited to pour any extras onto your tray; sprinkle it with items such as cocoa nibs, caramelized hazelnuts, sprinkles and those tiny candy hearts; let it cool; and then, using a small hammer, break the “bark” into pieces. Wasting food is a sin. That goes double when the food is chocolate. Sara Gore: Alright, well with the weekend ahead of us, there's no better time to treat yourself with some amazing chocolate. Jacque Reid: Mmm...definitely. Lauren Scala checked out two new shops putting a unique spin on our favorite dessert. Scala: Peter, what exactly is Voilà Chocolat? Peter Moustakerski: Voilà Chocolat is an amazing place where not only do we make delicious artisanal chocolates fresh every day from the best quality chocolate, but you, our customers, can make your own chocolates and customize them. Scala: So it's not just a chocolate shop that you can come into and buy chocolate, but it's an experience that you can have. Moustakerski: It's an experience. It's a chocolatiering atelier where you become the artist. Scala: And what are some of the things that you can do here? Moustakerski: You can do chocolate bars, lollipops...our most luscious and luxurious experience is the truffles: you can create your own chocolate truffles with creamy centers and the most beautiful decorations on top. We provide the "chocolat," and you provide the creativity. Scala: Well, that's good because I would like to make some chocolate right now. Is that possible? Scala: You don't have to sign up for a class. You can just walk in off the street. Most of the time [chocolatiering is] a big commitment, [but] here it'll take you about an hour. I mean my truffles are only taking 3 minutes and I can eat them. Truffles for Sara and Jacque, and, I think I'll be taking these chocolate bars home myself. Thank you so much, Christophe, this was so much fun. Gore: We have some delicious chocolates here. These are the ones that Lauren made for us at Voilà. Jake, age 4: I made a dinosaur and doggie! Reporter: Four-year-old Jake his big sister Jocelyn just spent an hour on this rainy afternoon two days before Christmas interning under Master Chocolatier, Christophe Toury. Jocelyn, age 6: ...I made [chocolate] bars. Peter Moustakerski: I eat precisely two ounces per day of dark chocolate. Every day. Reporter: Peter Moustakerski opened Voilà [Chocolat] on the Upper West Side because he knew of nowhere else in the world where a regular chocolate-gobbling man like himself might affordably spend an hour of his life playing chocolatier. Reporter: Tempering machines in the store heat and cool and then reheat the chocolate, keeping it moldable and looking as smooth as possible. Reporter: Jake spent less time critiquing that color or snap than he did sampling his creations. Reporter: But after just four years on this earth, the true holiday spirit did not elude this young chocolate-making and scarfing prodigy. Reporter: Voilà [Chocolat] vows to stay open late into the afternoon on Christmas eve, for any looking to forge some edible last-minute presents. From the Upper West Side, I’m Mac King, Fox5 News. Chocolate lovers can dip their own truffles, bars and other chocolate confections at Voilà Chocolat, a new chocolate shop and studio that offers abbreviated classes. Peter Moustakerski, a chocolate lover whose hobby has overwhelmed his home kitchen, thought there were others who would like to do some chocolate work without taking an elaborate course at a culinary school. During the hourlong session, Christophe Toury, the chocolatier, sets up the tempered, melted chocolate and all sorts of sprinkles for participants to pipe, dip and decorate. The retail area in front has truffles, bars and so forth for sale: Classes, beginning Thursday, start at $35; Voilà Chocolat, 221 West 79th Street, 212-920-8799, voila-chocolat.com. Voila: Do You Like To Do It Yourself? So the holidays are over. Helllllo winter blues. Seriously, what do you possibly have to look forward to in the coming months besides and the second half of Scandal (which you totally only watch on date nights because your girlfriend makes you…) and watching Liam Neeson overcome his bad luck for a third time? Well, it’s time to cheer up my sad studs! Get out from in front of that screen and head to Voila for a more creative date night. Go ahead, grab your honey, that co-worker you’ve been stalking, or the stranger you just ran into while reading this on your phone, and hop a train to the UWS. New York’s new chocolate studio is the hottest new DIY shop, where you can purchase some of the most delicious sweets this city has to offer and create them yourself. That’s right, until 9pm Sunday through Thursday, 10pm Fridays and 11pm Saturdays, you can choose your favorite ingredients (think dried fruit, hazelnuts, pistachios and Pop Rocks!) and learn how to make your own tasty treats from top chocolatiers like Christophe Toury and Dennis Teets. And it gets even better! Depending on the choice of chocolate you create, these lessons only cost between $35 and $79 per person. So, do you like to do it yourself? Head to Voila to find out. The new Upper West Side boutique — where customers can make their own bonbons and bars — mixes in a spoonful of matcha (the latest "it" ingredient) with 31% cacao. Activity dates are ideal when two strangers meet. If things don’t go well, there’s a built-in distraction. If things are going well, the activity can enhance the connection. The latter was the case for Elvis, 31, and Kat, 29, when they met for a night of chocolate making at Voilà Chocolat on the Upper West Side. Both of them went in knowing their sugar cravings would be satisfied, but it wasn’t just the chocolate that made for a sweet night. I knew that no matter how things went between Kat and me, I would have a good time because my sweet tooth is notorious. But when she walked in and I saw her big, bright smile, it made me want to make her smile more. She made me smile, too. Kat is a teacher, and though I’m not, I was an education major. It was nice to see how she has a profound passion for what she does. Her love for the Yankees was also impressive. I was relieved that she hates Alex Rodriguez like me. I can’t date a woman who likes A-Rod. Voilà was very cool. I was impressed with the team who helped us. The passion of our chocolatier made everything more fun for Kat and I.At the end of the date we exchanged numbers, and later that night, we texted and made plans to go out again. I’m excited. When I first approached Voilà Chocolat, I saw Elvis through the window and was relieved to see he was attractive. While we were making chocolate, I discovered we had lots in common. We are both native New Yorkers, the oldest of three siblings and care a lot about our families. Voilà was cute! Playing with chocolate was by far one of the best date activities I’ve experienced. We had lots of fun making truffles [and] chocolate bars and joking around while doing it. Elvis was a gentleman throughout the date. When we were leaving, he helped me with my coat and held the door. We exchanged numbers after we left Voilà. I would definitely see him again. Chocolate, unlike sausage, is one of those things that devotees will happily watch being made and even aspire to make themselves. These new plants and workshops are throwing their doors open to the public for tours, classes, and, presumably, robust impulse-purchase sales. The team here—including a master chocolatier who cut his teeth at Jacques Torres and a former Hershey’s chocolate scientist—will open an “experiential” shop this month where visitors can make their own treats, dipping and molding confections and crafting truffles using Guittard chocolate. Groups can rent the space (for team-building exercises, birthday parties, etc.) for events led by a chocolatier-instructor who helps guide students through the chocolate-making process at modular workstation pods. Voilà will also sell its own newfangled sweets—think s’mores truffles, which were a recent experiment for a City Harvest event." Voila Chocolat, a French chocolatiere on the Upper West Side, lets customers make their chocolate for the ultimate DIY Valentine’s day date. Chocoliteires give you step-by-step guidance on creating hand-made truffles, heart-shaped bonbons, chocolate dipped treats like strawberries, kiwi, pineapple, orange ,pretzels and biscotti. Here’s how it works: Take a seat at the “chocolating pod” where the melted milk, dark or white chocolate is poured into piping hot bowls. Once the chocolate is made and cooled, customers can take them home. You know what's great about chocolate? Well, besides that fact that it is delicious and almost everyone adores the tasty confection - chocolate is a treat for all seasons. It makes us happy. In summer we love chocolate ice cream. In autumn we celebrate the season of harvest with chocolate pies and chocolate treats for Halloween bags. In winter there's nothing better than a hot cup of cocoa to warm your frozen bones. And in spring, it's all about chocolate eggs and bunnies. Spring is a happy season. And this spring you can learn to make your own chocolate bunnies and eggs at New York's newest chocolate happy place - Voilà Chocolat. Voilà Chocolat is an experiential chocolate-making concept. It is the vision of chocolate lover Peter Moustakerski. Recently I sat down with Peter to talk about his creative endeavor. "After a few years in the financial industry I wanted to do something I cared about, something that would make me smile and make others smile," says Peter. Since its opening on New York's Upper West Side in December 2014, Voilà Chocolat has significantly increased the number of smiles in the neighborhood. Peter has brought together a chocolate dream team led by Master Chocolatier Christophe Toury formerly of Jacques Torres. Christophe began his career at the Ritz in Paris. He has been named by Pastry Art & Design Magazine as one of the 10 Best Pastry Chefs in America. Christophe loves watching customer reactions to discovering the chocolate making process for themselves. While many chocolate making classes and workshops focus on the history and science of chocolate, Voilà Chocolat focuses on fun. The experiential concept allows you to walk in off the street and make your very own high end chocolate such as enrobing truffles, creating bars and bark and more in 30 minute to 1 hour sessions. The process is simple enough for children, yet engaging enough for adults of all ages. The youngest patron so far was 14 months old - and he made chocolate. I love the story Peter shared with me about an elderly man who came to Voilà Chocolat immediately after being released from the hospital where he had just endured a heart transplant. He wanted to make heart shaped lollipops for his surgeons! Just in time for Easter, Voilà Chocolat is introducing its newest experience: 3-D chocolate molding which allows you to make your very own customizable 3-D Easter bunny chocolates and eggs, along with other shapes and objects. Instead of buying bunnies & chocolate eggs at drug or department stores (which often include additives and preservatives), you can create your own from fine gourmet chocolate with the ability to personalize for gifts. And if you can't make it this weekend, you can still make your own Easter bunnies and eggs with the 3-D Chocolate Molding Experience. The individual molding experience costs $45 per person and per creation. You can visit Voilà Chocolat at any time during the day -- via reservation or walk-in- to create your own one-of-a-kind 3D chocolate mold choosing from various animals, objects and shapes. In addition to creating the mold, with the instruction of Voilà Chocolat chocolatiers, you will be able to paint unique patterns and designs you’re your creations. You can, for example, paint unique patterns and designs onto Easter eggs, or add markings to a dog mold to resemble your own dog, or write your name or other messages. Spring is definitely a happy season, but I believe every season in New York is going to be happier now that Voilà Chocolat has come to town. Next time you are in New York, put this on your must do list - it is truly the happiest place in the city. Wannabe chocolatiers hightail it to Upper West Side newcomer, Voilà Chocolat, to roll their own coffee-filled truffles. Patrons who favor a more hands-off approach, however, get their cocoa cravings sated with the atelier’s rich 72 percent cacao hot chocolate. If the fiery Daredevil iteration has too much of a kick, spring for one of the more subdued white chocolate or green tea versions. 221 W. 79th St.
UPPER WEST SIDE — A make-your-own chocolate shop where patrons can dream up everything from simple bars to chocolate-covered lollipops opened its flagship store on West 79th Street Thursday. Voilà, the drop-in shop between Broadway and Amsterdam Avenue, features stations throughout the space where customers with a sweet tooth can create their own confections, including chocolate truffles and traditional French mendiants. The finished product is then packaged for gift-giving, or can be eaten on the spot. While initial guidance is offered on the process by staff, customers then work independently on their treats while socializing, explained founder Peter Moustakerski. The company sources its chocolate from the high-end Guittard brand and offers mix-ins and toppings like dried papaya and mango, hazelnuts, pistachios and even Pop Rocks, he added. The chocolate-making process can take anywhere from 30 to 60 minutes and costs between $35 and $79 per person, depending on what patrons decide to make, with truffles the most expensive option. "We exist so that people can do chocolatiering all the time," Moustakerski said. "It's really magical when you get to do it." Moustakerski came up the idea for Voilà when he visited the DIY craft chain Make Meaning, where he had an "aha moment" and decided to apply the same concept to chocolate making. He's spent the past three years turning his concept into reality. "Even the most daring and innovate people take you to an existing kitchen where the experience is industrial," he said of the existing chocolate-making market. 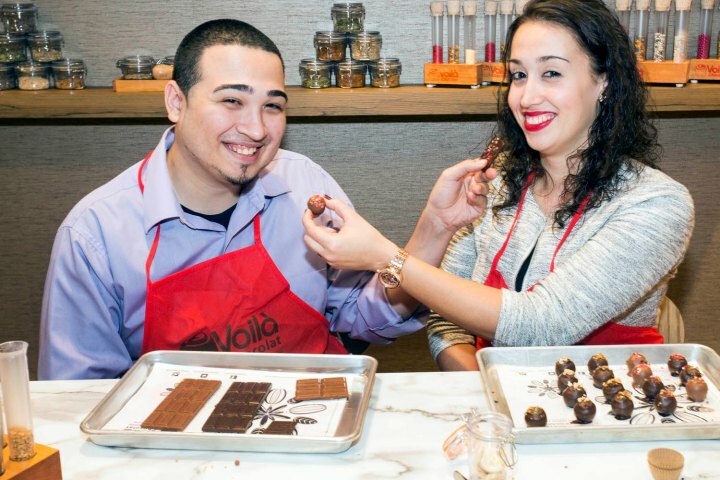 Voilà seeks to do the opposite, creating a relaxing atmosphere where people don't have to stand up or attend a formal class in order to try their hand at chocolate making, he said. In today's technology-driven culture, people are seeking "something more involved and hands-on" in their "search for meaning and self-expression," Moustakerski explained. The quality of the chocolate customers get to work is superior to what they might have at home or in a more "dumbed-down" class, said Elain Boxer, head of marketing for Voilà. Under the oversight of Christophe Toury — previously pastry chef at the Four Seasons and Mandarin Oriental hotels in New York — the chocolate is tempered, an important process that protects its quality. Tempering involves modifying the heat of the liquid chocolate so that it doesn't retain imperfections like sugar streaks when it cools, Boxer explained. "Anybody can melt chocolate. Tempered chocolate is what creates confections," she said. Part of Voilà's mission is to help the public better understand the chocolate-making process, as well as economic and sustainability issues surrounding chocolate. The company hopes that as consumers become more interested in the complicated growing and trade systems that bring them their coffee, the same will happen with chocolate. "We want to light sparks of knowledge," Moustakerski said. At the same time, if customers simply want to decompress and chow down, that's OK too. "It's however far you want to take it," he added. Voilà encourages reservations, but accommodates walk-ins and is open every day from 10 a.m. and until 9 p.m. Sunday through Thursday. It stays open until 10 p.m. on Fridays and on Saturdays until 11 p.m.
Everyone loves chocolate. Giving a box of the delicious delights for the holidays and special events just got a lot sweeter with the development of a new concept in Manhattan that is music to any chocolate lover’s ears. Voilà Chocolat located at 221 West 79th Street is the vision of Peter Moustakerski, who has brought together a chocolate dream team of Master Chocolatier Christophe Toury and chocolate scientist Dennis Teets. Together they have created the first-ever artisanal, interactive chocolate making entertainment experience, allowing customers to create their own gourmet truffles, chocolate bars and more. “We are very excited about this and we hope everyone has the same love for chocolate as we do,” said Moustakerski. Officially opening today it is sure to be a hit in the city. Voilà Chocolat is unique in the way it has guests to take part in an interactive and imaginative experience that has them create their own fine chocolates that include special dipped treats to customized bars and several yummy flavors of truffles. All ages and levels are welcome to partake in a range of fun activities. The offerings will allow for customization: white, dark or milk chocolate and choice of a wide variety of toppings. It is an amazing way to spend a weekend afternoon with the family or even a romantic second date. And the best part is the box of chocolates you take home to extend the enjoyment of the experience. At Voilà Chocolat, consumers will be able to craft attractive and delicious chocolate products at any time by dropping in for a session, ranging from 30 to 60 minutes, using the same top-quality ingredients and techniques applied by the finest artisanal chocolatiers. Special classes, such as tempering chocolate or building chocolate sculptures, and seasonal and holiday experiences will be offered throughout the year. Group events will be available and customizable within the 1400 square foot and up to 75 person capacity space or a private party room, which fits up 15 people. Inspired by both artisanal, high-end chocolatiering and native growing regions of cacao, the décor features clean white surfaces and natural textures and colors with pops of red accents. Voilà Chocolat hours are Sunday to Thursday 10 a.m. – 9 p.m. and Friday 10 a.m – 10 p.m. and Saturday 10 a.m. – 11 p.m. For more information, visit: www.voila-chocolat.com or call 212.920.8799. Experiences range in price from $35-$79. Voilà Chocolat founder Peter Moustakerski has recruited Christophe Toury as master chocolatier (formerly of Jacques Torres Chocolates) and Dennis Teets as head of chocolate technology (formerly a chocolate scientist for Hershey’s) to create an artisanal, interactive chocolate-making experience. Opening in early November on Manhattan's Upper West Side, the shop will allow guests to make high-end chocolates, like gourmet truffles, chocolate bars, and more, in 30- to 60-minute sessions. Pricing for classes ranges from $39 to $79, with special advanced classes and projects ranging from $100 to $150. For media and press inquiries, as well as partnerships and other marketing opportunities, contact info@voila-chocolat.com.